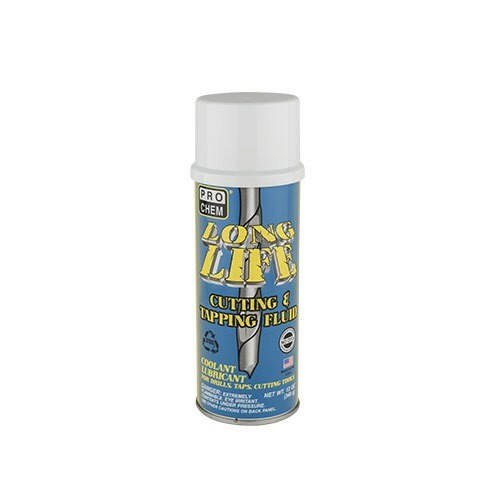 Long Life | Pro Chem, Inc.
LONG LIFE is a clear, synthetic coolant and lubricant for portable and field operations. Can be used for any punching, drilling, tapping, sawing, machining, cutting, boring, threading and grinding operations that do not have their own recycling coolant unit. Helps protect treated surface from corrosion. Suitable to use on all steels and non-ferrous metals including stainless steel, titanium, bronze, inconel, monel, phosphor, aluminum, copper, lead, brass, alloy and other metals except magnesium. Provides better visibility of work area because fluid is transparent. This product is designed to disperse heat and cool work pieces, causing less heat distortion and tool burning, thereby increasing production and lengthening tool life. Can be removed easily with cold water or solvent degreaser. LONG LIFE is suitable for use as a lubricant where there is no possibility of food contact in food processing and food handling establishments. Spray area to be worked generously. Reapply as necessary to keep work area cool and well lubricated.Can be removed with water or solvent degreaser.